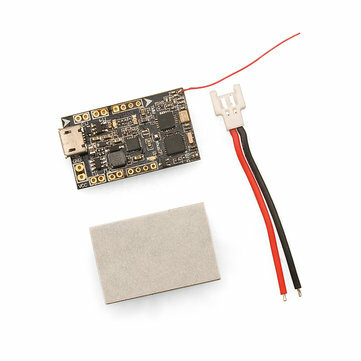 1.FRF3_EVO Brushed Flight controller is an integrated Frsky compatible 8CH SBUS protocol receiver,based on F3_EVO Brushed Flight Control Board. 2.It is integrated the FRSKY receiver into the flight controller, avoid the welding trouble, and the installation is more convenient, suitable for ultra small brush racing quadcopter. 5.With a 4-axis large current NMOS transistors, operating current of up to 10A or more.Support almost all hollow cup motor, including 1020 coreless motor. 6.With VBAT voltage detection, external buzzer interface, LED_Strip function, also can be configured WS2812 light. 1.Soldering the bind pins, and then connect the battery, the Green LED is solid,this indicate receiver is in binding mode. 2.Turn on the transmitter, select D8 mode for the receiver.click the opotion. 3.The Green LED on the receiver will turning off,this indicate that the bind process was successful.Reconnect the battery,and the green LED on the receiver is solid again.